I have four dogs and they all do Nosework. Their talents are all different and they have all taught me something special about this journey that we’re are on. Each of their journeys is different, but one is no less special than the other. This weekend I had the chance to work two of my dogs on opposite spectrums and although one titled and one did not, their days were equally special. Joey getting ready for his Big Day! I worry very much that folks get too wrapped up in the titles. Titling is FUN. Winning is FUN. I get it. I really, really do. This is not a case of sour grapes. I’ve had my fair share of titles all the way through Summit League. But not all dogs will get to Summit League. And you know what? It’s really ok! It doesn’t make the dog any less special, the handler any less capable, or the journey any less important. The important thing is to find your own joy. Yes, ribbons are exciting and if you title, WAY TO GO! I’m super happy for you. I really am. I’m also super happy for the handler who FINALLY passed Containers or who didn’t make up a hide in a Blank Room. 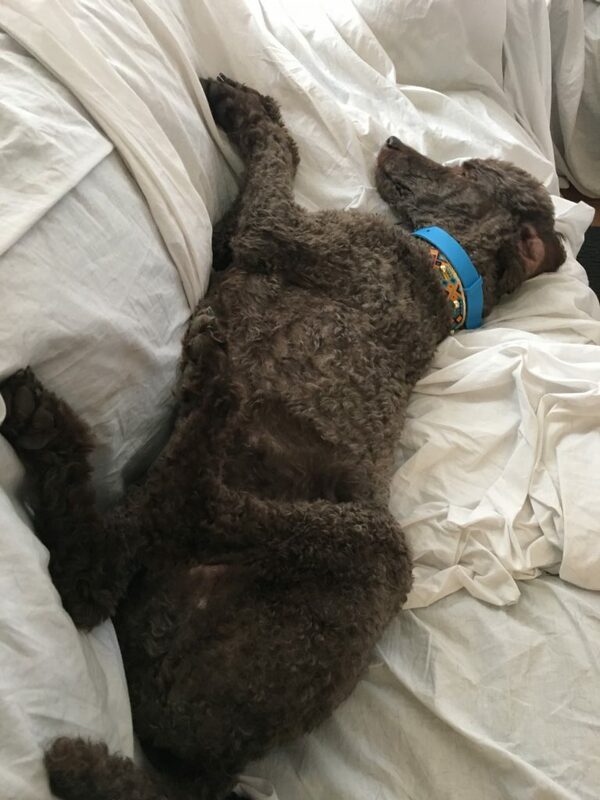 Today Joey, my Standard Poodle, attempted NW3 (again). He did well! We had a false alert in Containers because of the bellows effect from the door opening and closing, however that happened to a lot of other dogs too. We also missed a hide in Interiors, but a lot of dogs missed the same hide. However, he found all of the other hides in the trial and we called the Blank Room correctly! One of these days he will earn his NW3. I’m not worried. Here’s the thing… the searching part isn’t actually Joey’s favorite part of the day! What he loves is getting to be the “Star of the Show”. (I tell my dogs in the morning who gets to be “Star of the Show” that day…). He got to be the special one to get out of the van. Joey loves Staging Areas! He gets special scritches and tons of cookies in Staging Areas. Then, on the way back from the search, no matter how it went, he gets to feel like Superman. He trots back with his tail up, getting cookies all the way. He puts on his “Happy Ears” which tell me that he is especially pleased with himself! A passed search is just icing on the cake! You see, Joey will NEVER search like Judd or Brava. Brava did her NW2 yesterday. She came in Second Overall with 3 P’s and a smoking placement in Interiors. She is hell on wheels and the only challenge is keeping her sane in the Staging Areas because she wants to SEARCH NOW! Titling IS fun! I am super proud of my little girl who hasn’t even reached her second birthday! Brava is hell on wheels, but I had this same smile with Joey today! Joey just isn’t wired like Brava. Joey has nearly no appreciable food or toy motivation. He is older (11.5 years) with low stamina. Joey is “low drive”, and he has no Hunt Drive to speak of. But you know what? We have fun! When the hides are right for him and the wind speaks to him, he can do REALLY well! He placed in the top three in both his NW1 and NW2 trials. The boy CAN search, but his journey is not about speed. It’s also not about the relentless drive to source that gets your blood moving, giving you a real search high. His journey is special and it’s about companionship. It’s about him getting his “Special Day”. If I was wrapped up in “The Title”, I would risk being disappointed in my dog. I might even quit trialing him. The point isn’t to win or title. The point is to enjoy this very special sport with my very special friend. There are WAY more Joey’s out there than there are Brava’s in this sport. Here’s the other thing. There are WAY more Joey’s out there than Brava’s in this sport. This sport isn’t just for the Brava’s in this world. If we get lost and start thinking of Nosework or Scent Work in terms of ribbons, we are going to thoroughly shortchange our dogs. We will experience disappointment, and we will lose an opportunity to just enjoy the journey. I encourage all of you to challenge yourselves to get more “into the now”. Treasure every search, every trial. Absolutely rejoice in accomplishments, but be careful not to make is ABOUT the accomplishment. And please remember that everyone is on a different journey. Titles and placements don’t make one team better than the other. What do YOU love about searching and trialing with YOUR dog? Excellent blog. While I do love the titles, my goal for my anxious sheltie is for him to be able to be at a trial and still be comfortable with the environment. He loves searching, but early on being at a trial was a real challenge for him. The first trial (maybe our third NW1) where he felt comfortable enough to sleep in his crate between searches was way more important to me than that NW1 ribbon (though both would have been terrific). Our journey has been a slow one and an adjustment in goals for me, but I’ve loved every minute. I hope Augie dog is having as much fun as I am. BTW, SUPER CONGRATS on your NW2 this weekend with Augie! I totally get it… I really, really do!! just starting the ominous journey of NW3 with two dogs, I need to hear “yeah take your wins as they come, doesn’t always mean a title” so thanks for keeping that in front of our eyes. I love what Nosework has done in improving Woodson’s confidence level, his enjoyment of life in general, and strengthening the bond of our relationship. Trials have been an opportunity for us to have adventures, finding great places to hike and hang out on overnight stays – building lots of memories. He is soft dog that is drivey doing Nosework- I want to protect that at all costs. So, my focus is on working each search and enjoying the challenge and our teamwork. We titled on our first NW3 attempt a couple of weeks ago, and thrilling as that was, the best part was going into searches with my dog with eagerness and confidence and leaving the searches knowing that we had done our best, – if we missed a hide, no big deal. Just enjoyed and relished every moment of the day! I too love titles and ribbons. However with my almost blind lab it’s all about fun and building confidence. Our first nose work 1 trial the containers were under a structure causing frightening shadows. My dog did not want to enter the search area. I politely declined and took my dog away. Then we go to the interior search. The house had a black floor. The volunteer opened the door and my dog backed up and let me know there was no way he was entering the abyss. I again excused my dog. The vehicle and exterior searches we aced. Even placing 3rd in vehicles. I considered the day a success! We will try again and keep training. Why I love the NW journey with my sensitive, environmental, neither very food nor toy motivated boy so very, very much? recently, for the first time in his life (he is almost 4yo), he immediately PUSHED me to work in a new (!!!!) environment as he realized that I had some NW stuff with me! And his confidence and motivation are growing! LOVE this. This was my past weekend. Over three years in the making just to get to the start line with my dog, Zero. To say he is environmental is a huge understatement and it took a village to get him there. We first had to make going on the road fun, and then just being able to hang at a trial. He will only ever do certain trials and most likely just the lower levels of AKC but his tail was wagging and I am pretty sure the Rocky theme was playing in his head on the way back to the car. 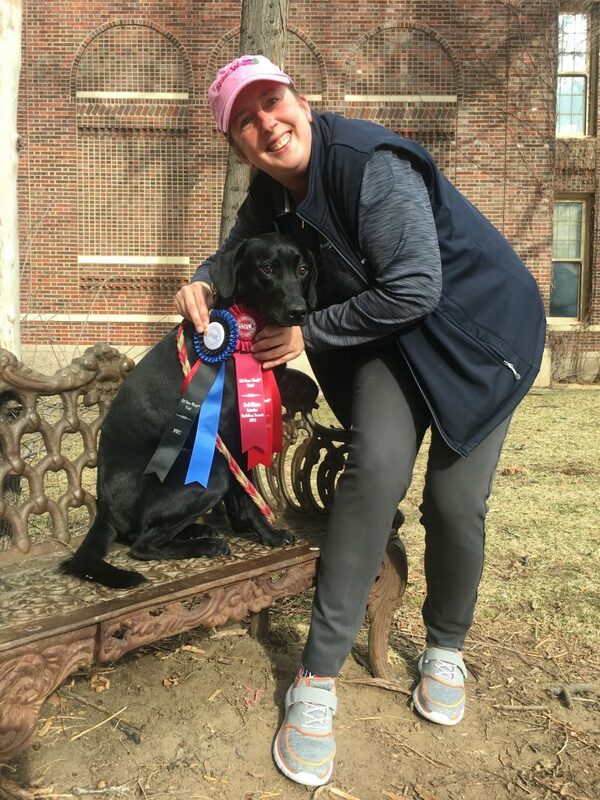 The green qualifying ribbons were the icing on the cake, the tears were happy ones for being able to play with my dog and all the friends that helped me get there. This is a very good thing to remember . I just trialed in an AKC event Friday and my little 5.9 pound rescue that was found dumped in a cow pasture , received her novice container title. I love this because she loves it. She has come such a long way and she is an inspiration to me, and most of all , she has fun ! I so loved reading this! I’m now working my 4th Portuguese Water Dog in PWD Water Work. He is a SUPERSTAR!! But the one I learned the most from, the one I had THE most fun with, was Grady. It took him a long time to decide he wanted to play the water game…and he was never going to understand the concepts of the upper levels….but guess what? We did Water Work and entered trials until he passed away. He learned to LOVE it and was SO proud every single time he came off the boat. I adored that about him and I’m forever grateful that I chose to continue our journey. After writing and then deleting 2 long posts I’ll just say that I wish I could have “liked” all of the previous posts. I smiled while reading through them all. This was a fabulous blog topic. My Morgan has been the best companion d og I’ve had. I’ve had two other dogs before her. We have not done Nosework before. We are just getting into Nosework we earned nw1 nw2, and getting ready to trial NW3. She is nearing 14. She is deaf now. Every day is special for us. She looks at me with a look I can’t explain. Almost an adoring look for each of us. We both enjoy the Nosework games I call them. She gets so into the game. But I see her look at me she sees into my soul. We are good for each other. I treasure every day together. There’s a special energy that I feel when we trial. I love it. She loves it. We play this Nosework game for each other because it makes us happy. Not much more I can say. I have a Joey and his name is Scooter. We trialed the NW3 with you. I had an epiphany in December that Scooter’s joy in Nosework isn’t especially about the searching; it’s his time with me. That was the attitude I had yesterday and we had an awesome time. No title, but it was his special day. If I hadn’t had that aha moment in December and embraced it, yesterday would have had a different emotional outcome. I Trial with 3 dogs and all are different. Each one brings me joy in a different way. Great article-you described Scooter and me perfectly. I just love this Stacey, thank you so much, it really is all about getting out there and having fun with your dog and enjoying the journey. I have a 13 year old GSD, a 12 year old border collie and a 10 year old collie. Stacy is so right. I started nose work in 2009 when my GSD was 3. He didn’t make Elite Champion, he retired just shy of Elite 2 as his sight became poor, as well as his hearing. He loved nose work and loved trials, but at the last trial he was uncomfortable because he couldn’t see well and he was nervous about his surroundings. My border collie is retired too as he slips sometimes because of an arthritic hip. My collie made it through NW2 and we stopped trialing because he was too anxious about new environments. So now we walk in the woods, do nose work close to home and enjoy each others company. I miss trials. I had so much fun, and there won’t be a new dog for awhile. I started nose work before we even had a trial in the Northwest. It was all about fun with our dogs, and did we ever have fun. I want everyone who reads this to remember to have fun! If you do, your dogs will. Thank you Stacy for an excellent blog. You have changed my whole perspective on trialing. When we Trial and don’t title It’s so easy to focus on our mistakes rather than our accomplishments. Love this! Example that illustrates this for me: Baby dog Flicker made her NW3 debut last weekend. On her very first search, she went into a cabin bunk room and immediately started playing “hotel Olympics” (jumping from cot to cot) and then gave a false alert. Of course I was a bit disappointed to be out for the day on her first search. But she never knew that when we started the search of our second room. And I also laughed my head off with her all the way back to the car and made sure she never knew we had failed. At the end, when our nosework journey is over, this is a memory I will treasure. Her love of life and enthusiasm and joy will always mean more than anything else to me.